The UK economy grew by 0.8% in the first quarter of 2014, according to the latest figures. It marks the fifth consecutive period of GDP growth - the longest positive run since the financial crisis. Gross domestic product is a measure of a country's economic activity, including all the goods and services produced in a given period. The Office for National Statistics (ONS) also said the economy is now 0.6% smaller than its 2008 peak. Chancellor George Osborne said Tuesday's figure showed that "Britain is coming back", but that the recovery could not be taken for granted. "The impact of the Great Recession is still being felt, but the foundations for a broad based recovery are now in place," he added. "The biggest risk to economic security would be abandoning the plan that is laying those foundations." Shadow chancellor Ed Balls said that despite the positive growth figure, "millions of hardworking people are still feeling no recovery at all". "Now that growth has finally returned, the question is whether ordinary working people will properly feel the benefit and we have a balanced recovery that's built to last," he added. 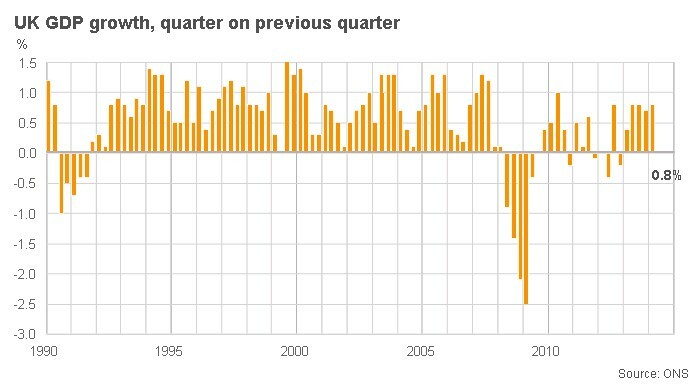 The ONS's first growth estimate for the quarter is a slight increase on the 0.7% recorded for the final quarter of 2013, and a rise of 3.1% on the same period a year ago. But many had been expecting it to be even higher, at 0.9%. "While this figure has missed estimates, slightly, the overall feeling is still one of strength in the UK," said Jeremy Cook, chief economist at currency brokers World First. "In fact, this is the kind of news the economy needs - solid but not spectacular." UK manufacturing was one of the strongest performers in the latest figures, with output growing by 1.3%, the ONS said, its strongest quarter for nearly four years. And the service sector, which includes everything from hotels and leisure to accountants, grew by 0.9%, accounting for almost all of the overall quarterly growth. Construction output, which grew by 0.3%, was affected by the storms and high rainfall in January and February, the ONS said. But it added that the bad weather did not have a significant impact on overall GDP growth. Agriculture was the only one of the four main industrial sectors to register a fall in output, dropping by 0.7%. Earlier this month, the International Monetary Fund (IMF) said it expected the UK to be the best-performing of the world's largest economies in 2014, with growth of 2.9% for the year. The independent Office for Budget Responsibility (OBR) predicts 2.7%, and in February the Bank of England (BoE) raised its 2014 forecast to 3.4%. But despite the strong growth, the BoE has indicated it is unlikely to announce an interest rate rise any time soon. Its stance has been bolstered by falling inflation, which dropped to 1.6% last month, its lowest rate in more than four years.